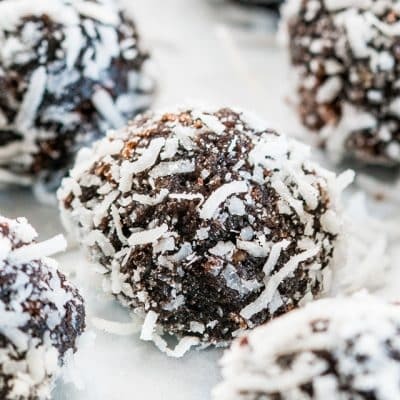 These Chocolate Rumballs coated in shredded coconut are a delightful bite sized treat sure to make you want to reach for another and another. 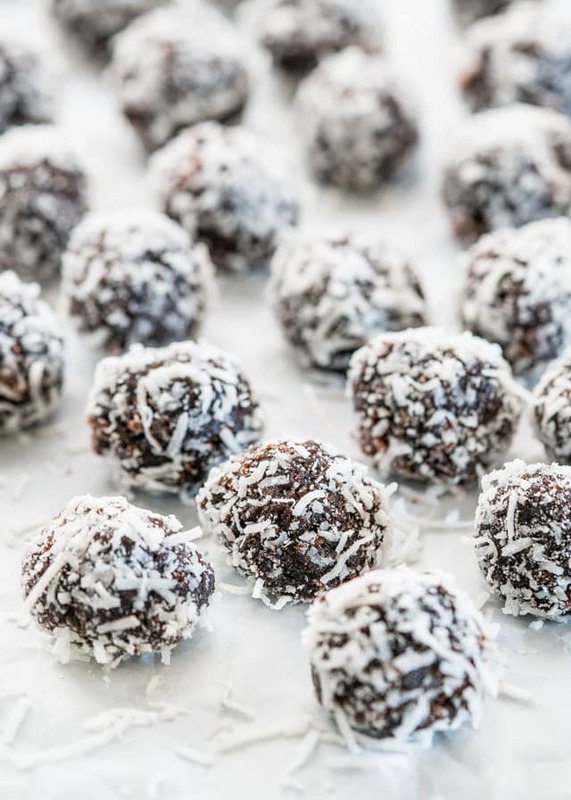 I’ve been making these chocolate rumballs for quite a few years now, don’t want to tell you exactly how long because it will give away my age and I’d like you all to think I’m still 29. Ahem! I think I saw my nose grow a bit. Anyway, I can’t remember the name of the book, very old book, but my friend had this book full of desserts made from cake mix and this recipe comes from that book. There is no holiday at my house without these rumballs. Any potluck I ever attend, I bring chocolate rumballs. We absolutely love them. Let me tell you why. The secret is the rum, and I love to add a bit more rum. In the recipe I say 1/4 cup of rum. But not me, I add 1/2 cup and when you eat one, it’s like having a chocolate rum shot. They remind me of a chocolate martini. 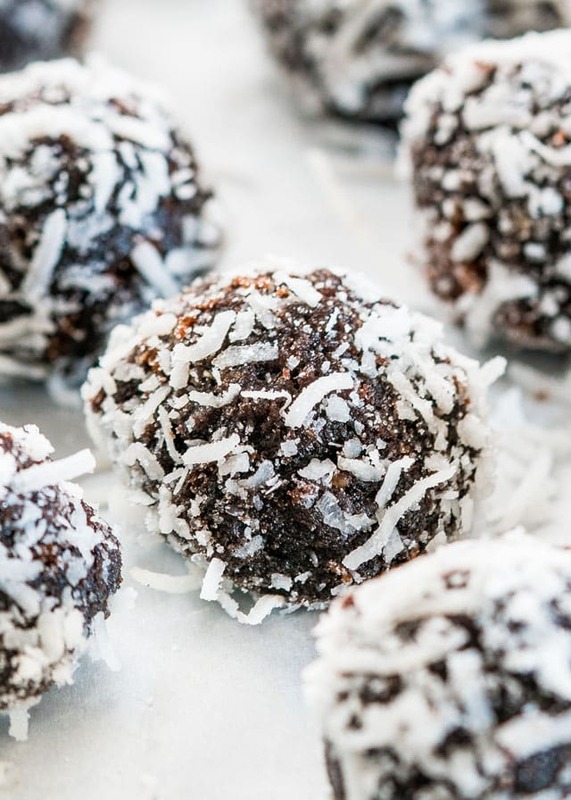 The beauty of these rumballs is how easy they are to make because you’re using cake mix. You make the cake, add the rest of the ingredients, and roll ’em up. Usually what I do is as I roll them, I throw them in the bowl with the shredded coconut. After I have a few in the bowl, I wash my hands and I roll the rumballs in the coconut. You don’t want to wait too long, the balls might dry out and the coconut won’t stick so well. Repeat until you’re done rolling all the cake mix. And that’s all there is to it. Now you can enjoy eating them. They are delicious. One of my favorite holiday cookies. Try some of the recent 12 Days of Tasty Treats! Preheat your oven to 350 F degrees. Spray a 9x13 inch baking pan with cooking spray. Set aside. In the bowl of your mixer add the chocolate cake mix, eggs, milk and vegetable oil. Beat on medium for 2 minutes until well incorporated. Pour cake batter into prepared baking pan. Bake the cake for 30 to 35 minutes or until cooked through. Insert a toothpick in the center of the cake, if the toothpick comes out clean the cake is done. Let the cake cool completely. Remove the cake from the baking pan, and crumble it up in a big bowl. Add the powder sugar, rum, cocoa powder and the chopped pecans. Mix well. Initially you may think there's not enough moisture, but as you mix it, it will all incorporate really well and you will be able to roll rumballs. Start rolling, the rumballs should be just a little over an inch in diameter. After you rolled them between your hands, roll them in the coconut. If you're looking for an alcohol free version, try a cake pop recipe. While rum is my favorite for this recipe, you can use whichever your favorite type of liquor is for the flavor. You can store the rumballs in an airtight container in the fridge for over a week. I am going to try yours this year. 1. Combine melted chocolate, sour cream, paste and salt. Cream well and set aside. chocolate shot. Mix until it holds its shape. 3. Add chocolate-sour cream mixture and knead with your hands until blended and soft. to pick up the chocolate shot. make smaller sized balls approx teaspoon sized). Put them into tins and refrigerate. few hours before serving to soften slightly and bring out the rum flavour. 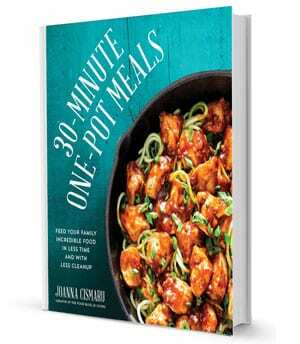 This recipe is from Diane Clement’s Chef on the Run. 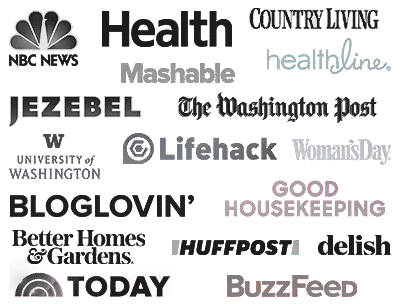 Tips I have learned over the years. 1. Use disposable gloves! It makes clean-up easier and prevents chocolate/sugar overload. slices. This is much easier on the hands and much quicker. 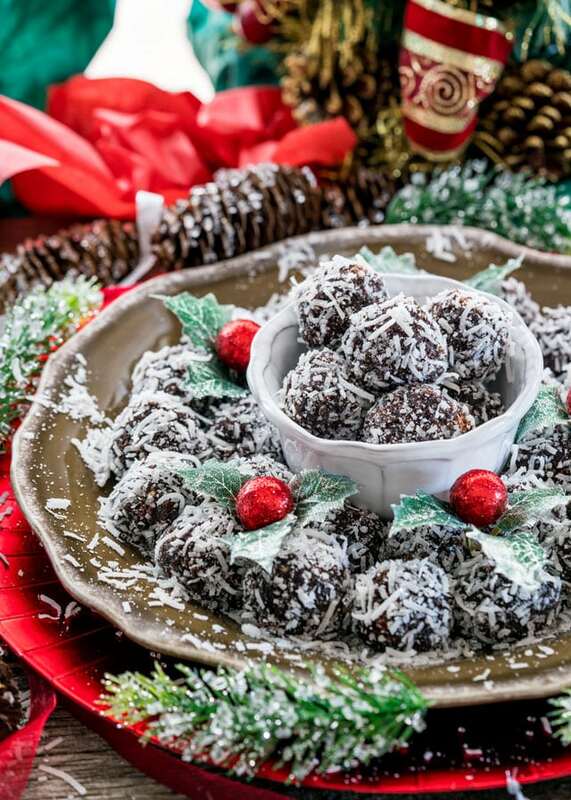 Whole Foods) before rolling in the chocolate vermicelli/shot (also from Charlie’s Chocolate Factory) or coconut or crushed candies or finely ground nuts etc. Not only do the toppings stick better but the layer of solid chocolate around the rumball keeps it fresh much longer (Tip from Charlie himself!). I use a slotted spoon full of melted chocolate then place rolled rumball onto the spoon and roll it until covered before dropping it into the vermicelli/coconut/etc. 4. Use parchment paper covered plated or paper plates as they fit into the fridge better than big pans. Clean up is also faster and easier. Oh, thanks for this recipe. I will have to try it! Is it okay to use a home made chocolate cake recipe or is a boxed cake recommended? Any suggestions to replace the alcohol in these? Not sure as all you have to do is click on the print button for it to print. These sound sooooo good but I bet they’d be even better using Spiced Rum. Will have to try. I have always made the chocolate fudge rumballs with the wafers, chocolate, ground nuts etc. and they are wonderful but my favorite place to eat and buy unusually good sweets which is called Andres on the Plaza in KCMO, anyway they have a lovely cake type rumball and wanted to make some and I found your recipe which sounds wonderful but my question is I always send my cousin in England my fudge and rumballs etc., etc. Do you think this type of cake rumball could also be sent by mail and still be good? Let me know what you think. Thanks for the recipe, looking forward to making them asap. Instead of cocoa powder, I use melted chocolate and omit the sugar too. Simply divine! Love the taste. Was not crazy about consistency. Too gooey and sticky. I have to keep adding powdered sugar. I used 1/2 c of rum instead of 1/4 so maybe that is what made them wetter than they should be. WOW! I followed your basic recipe but used a 13×9 pan of homemade brownies and Krupnik, a Polish honey liqueur and then rolled them in powdered sugar. They’re amazing! So easy and will be a hit, I’m sure. Thank you!! Glad you liked them Danielle! Do these get better as they set like regular rtum balls? They sure do, the longer they sit, the better they are. how long will they keep?? what is the best way to store them if I am making for a party about 4 weeks time?? I usually keep them in a plastic container in the fridge. I’ve never kept them for 4 weeks, but they will last at least 1 to 2 weeks. So I had a total cake fail. Made a chocolate rum cake from another blogger. Delicious cake, but it totally stuck to the pan. So I scoured the Internet in an effort to salvage what I could and came across your recipe. Thank you. Clearly that cake was destined to become these chocolate rum balls. I rolled mine in chocolate jimmies, and they are little bits of heaven. Lol, see sometimes kitchen accidents can turn into kitchen wonders.